A television interview in Halifax during my cross Canada tour. This was a radio interview with CBC-Regina during my cross Canada tour. This post is part of an initiative on our site called “In Our Own Words: Living on the Spectrum,” which highlights the experiences of individuals with autism from their perspectives. 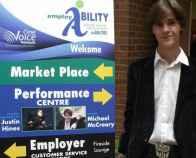 MICHAEL MCCREARY IS at the tail end of a national tour of his standup-comedy show Does This Make My Asperger’s Look Big? when the Straight reaches him in Calgary. 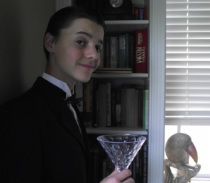 We came across Michael’s website AspieComic and wanted to learn more about this young man with a gift for making people laugh while raising both autism awareness and empowerment. We were lucky enough to be able to interview him before he set off on his Canadian tour. Stars For Life is hosting an event at the Rodd Royalty Inn, called Evening of the Stars, with help from Wayne Rostad. McCreary’s performance will be titled Does This Make My Asperger’s Look Big? "Her special guest is 17-year-old comedian Michael McCreary, who offers a satirical take on living with Asperger’s syndrome." 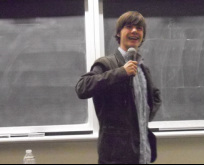 "If laughter is the best medicine, Michael McCreary is earning his PhD. 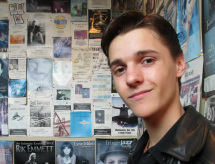 At age 17, the Orangeville resident is appearing in comedy clubs he’s technically not old enough to enter..."
Donating their time and incredible talents to the evening are performers Jonah Azzopardi, Neil Crone, Rique Franks, Glendale One, Bruce Harvey, Jordan Hilkowitz,The Illustrated Men, Michael McCreary, Samantha Mutis, Shakura S’Aida, Carolyn Scott, Women Fully Clothed (Robin Duke, Jayne Eastwood, Kathy Greenwood, and Teresa Pavlinek)"
"This year’s hilarious evening features the comedic genius of 16 year-old Michael McCreary...Join him as he takes you on a comical journey through the lighter side of Asperger’s Syndrome." Shared the stage with Phil Palisoul. "...with a burst of energy, 16-year-old Michael McCreary leapt to the front of the platform, his hands placed firmly on his hips. "And now, in an effort to promote Aspie awareness, I've created Socially-Awkward Man," he announced to the auditorium, striking a pose like Superman." "The jokes keep coming during Michael’s fifteen-minute set – a frank, edgy, and decidedly mature skewering of life as he sees it." 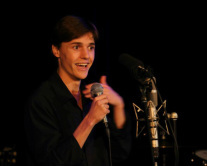 "Michael McCreary, 14, presented his stand-up comedy routine to much applause."